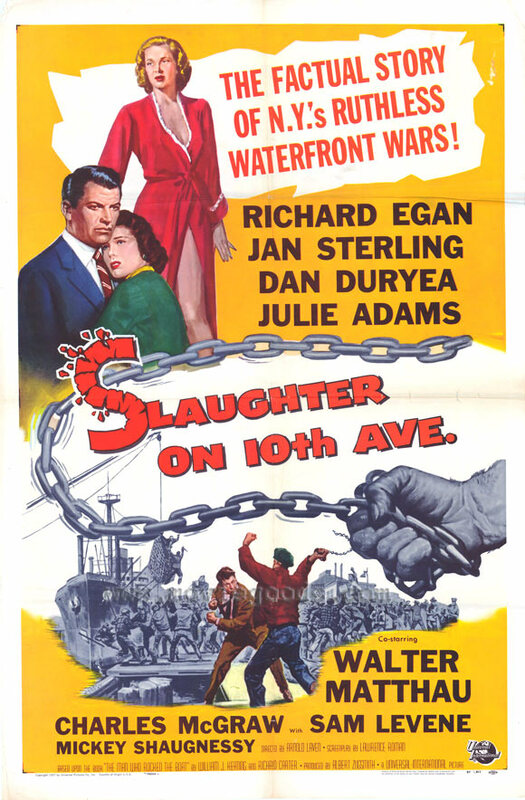 "Slaughter On 10th Ave." is a film that I'm unfamiliar with. As you pointed out Laura, it's not available on ANY form of home-video and it's never revived on TV. It would be a good thing if Universal would "step up" their made-on-demand DVD program and released films such as this one and "Naked Alibi" REGULARLY (like the WB Archive does) instead of haphazardly as they've been doing. BTW Laura, on a completely different subject (and for anyone else who lives in the So. Cal. area) "Twilight Time" is hosting a screening for their newest blu-ray release "Journey To The Center of The Earth" Thursday May 3rd and Saturday May 5th at the Warner Grand in San Pedro. To see and hear one of the old CinemaScope films in a venue such as the Warner Grand is a real treat! Re Johnny O'Clock. A film I admire. A story of sexual obsession rather than a mystery or crime entry. It is compeltely noirish using the definition of noir as material depicting lost and sadly loser souls. Seen with this sensibility Johnny works just wonderfully. Thanks for the kind words, Laura. We really appreciated meeting you too and look forward to seeing you again. I must say this held up very well for me, and was my best viewing of it since 1957 when I also saw it theatrically. I've seen it a couple of times over the years on TV, appreciated it, but it does gain so much on the big screen, like any good movie this good. 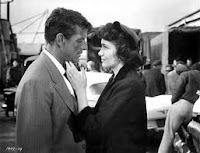 I can't argue with anything you said about the people you singled out in that great cast--McGraw and Duryea are both favorites of mine and Levene always solid--but I would just add two things. First, that those who know Walter Matthau from the greater part of his career later when he had quite a lovable persona in all those comedies might be surprised at how stunningly effective he is as a ruthless rackets boss, really mesmerizing and I remember this was the first movie in which he jumped out for me as a brilliant actor. Second, for me Nick Dennis as Midget, although it is a small role, is key to making the whole so moving and he is central in what are for me its two best scenes, the long early one that begins on the docks and continues in his room with Egan, and the final one, in which he is the only remaining character after everyone else has left. The detail of this final scene--and the choreography of both camera and actor (with great help from Rodgers' wonderful music)--clearly show directorial inspiration above all else, and when I had the fortuitous opportunity to speak with Arnold Laven once I asked him about it, and he was pleased that I noticed and very proud of what he had done there. A real epiphany--and kind of unexpected--in an already excellent movie. Laura, I don't know where you get the energy! You drove back to Orange County from the Egyptian and wrote this last night. It's impressive. Hope to see you again soon and it was such a great pleasure to meet at the movie. Brad, thank you so much for pointing out that screening in San Pedro, it sounds great! I wish I were able to see it (I have tickets to return to the Egyptian on the 5th); it sounds like a great opportunity and I hope film fans will take advantage of it. I couldn't agree more re Universal films. I've seen a couple of their releases distributed by Amazon and movies like TOMAHAWK and SEMINOLE are gorgeous -- but there is a vast untapped library of titles out there, as this film festival hints. I would love to see a program of regular DVD releases. Barrylane, couldn't agree more re JOHNNY O'CLOCK, I think it's a terrific film. 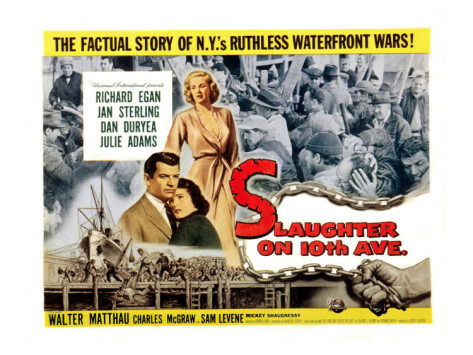 Based on my first viewing it's up there with CRY DANGER as my favorite Powell noir. I'm looking forward to taking a fresh look at it. Hi (again!) Blake, and thanks so much for the kind words. What a great evening! You bring out some excellent points. I was trying to think of who Nick Dennis as the belligerent Midget reminded me of, and it came to me while reading your comments -- Belker (Bruce Weitz) on HILL STREET BLUES. That scene where he looks at the photos on his dresser in his ratty room is a heartbreaker. Looking forward to seeing you and Linda again before too long, and I'll be enjoying the book in the meantime! Thanks again so much for everything. 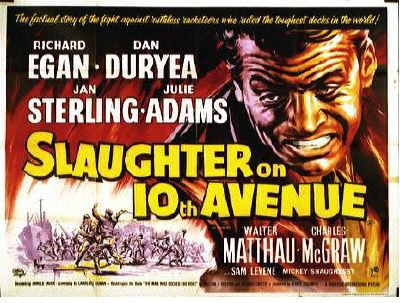 I remember watching "Slaughter on 10th Avenue" on television with my Dad. He called it a "dandy". Most of the movies he referred to that way happened to be film-noir. It's a habit I picked up early and still use. I haven't seen the movie since those old days though. You brought back memories and moved it to the top of the must-see list. I like that, Caftan Woman -- this film was, indeed, "a dandy." I hope you can see it soon. As Brad said in the opening comment, Universal *really* needs to step up their releases. There are so many great Universal (and Paramount!) films "behind the Universal wall" which are impossible to see or can only be seen via "bootleg"/"gray market" copies. It doesn't seem right for such significant pieces of our nation's film history to be so inaccessible. Universal is to be applauded for striking exceptionally beautiful new 35mm prints for Noir City. Hopefully before too long they'll put more effort into DVD releases! Thanks for your review, Laura. I saw this film recently and agree it has a great cast. I always liked Richard Egan and wish he had got more starring roles. He is very good in VIOLENT SATURDAY. 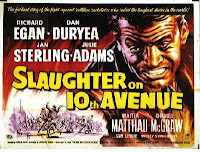 It was so unusual to use Richard Rodgers' "Slaughter on 10th Avenue" as the soundtrack for the film. It worked very well. This wonderful piece of music is from the Broadway musical ON YOUR TOES, which Hollywood managed to turn into an inferior film. I like Jan Sterling and thought this was a very interesting and unusual role for her, quite a different character for Jan, as the faithful and brave wife - no glamour at all. A pity Julie Adams didn't have a bigger role. Surprising that Dan Duryea didn't appear till an hour into the film.